just one mile from the town centre but with beautiful open views of Weardale and the surrounding countryside. We have been breeding Persian cats since 1987, producing most colours in the Himalayans series but with a special interest in the chocolate series. By combining top lines from the U.K., U.S.A. and Europe we are producing beautiful kittens with a sweet expression and wonderful temperament. Health and welfare is very important and we are at present DNA testing all our cats for PKD at the UC Davis Laboratory in California USA. Our dogs, cats and kittens are family pets, raised underfoot in the home with the family until they are ready to leave us from 12 weeks of age when they are well socialised and ready to become part of a new loving family environment. she spends a lot of time with the kittens, playing with them and grooming both the kittens and the cats. Karla, our first Lhasa Apso dog became part of our family in 1997, she has had one litter of puppies which was a wonderful experience for Karla, from Karla's litter we have Ellie and Sweep. Ellie had one litter of puppies and from her litter we have Alicia and Robbie. Although we do not breed Lhasa's now, some of our Lhasa's have had puppies of their own so please contact us if you are looking for a puppy. 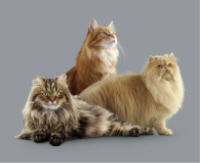 We are particularly proud of Kayamy Suzie Special, a cream persian carrying colourpoint, a Champion with both G.C.C.F. and F.I.F.e. in 2004.